Sugar Gingerbread. Mrs. Ripley. No. 1. 1 lb. sugar 6 ounces butter 4 eggs 3 tea spoons ginger 1 & 1/2 lbs. flour 1/2 cup milk mix well, bake immediately. Susan's Gingercakes. No. 1. 1 teacup sugar & boiling water enough to thin it to syrup 4 tablespoons melted butter 1 tablespoon ginger 1/2 teaspoon soda. Flour to make it stiff enough to roll out. Charley's ginger cakes No.2. 1 cup butter 1 cup sugar 2 cups molasses 1 cup warm water 2 tea spoons soda 4 table spoons ginger Knead until stiff - roll out thin & bake in hot oven. Gingerbread No.2. 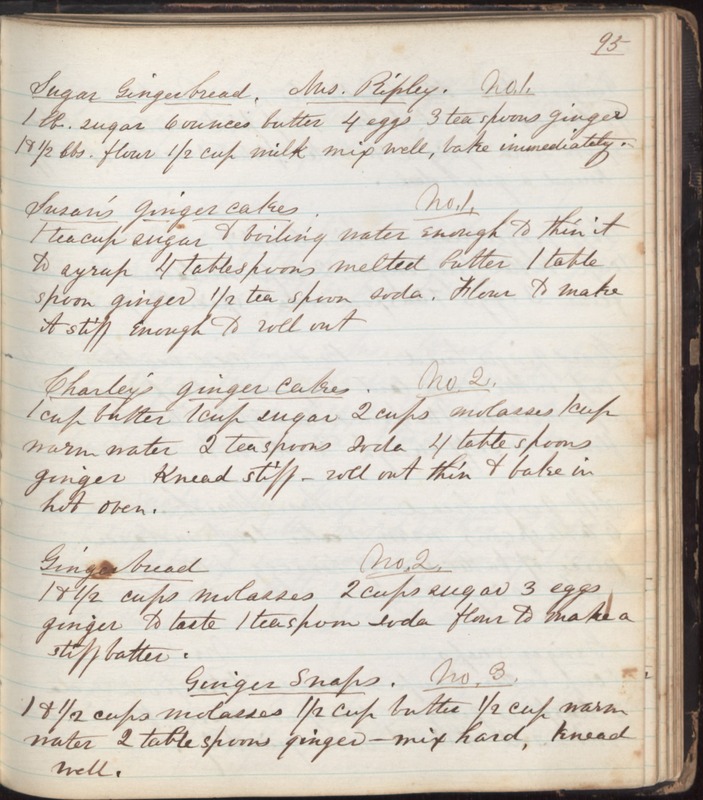 1 & 1/2 cups molasses 2 cups sugar 3 eggs ginger to taste 1 teaspoon soda flour to make a stiff batter. Ginger Snaps. No.3. 1 & 1/2 cups molasses 1/2 cup butter 1/2 cup warm water 2 table spoons ginger - mix hard, knead well.